People ask me how I get my skin to look glowing and healthy without toxic department store makeup with harsh chemicals. And the answer is easy! I use the most natural and organic products I can find that deliver high quality results. I was inspired by Glossier to do a post on my natural beauty routine on how I get glowing, healthy skin. When I apply my makeup, I want it to show my natural beauty, not alot of makeup. When I think of beautiful, glowing skin, I think of my favorite natural beauty maven, Josie Maran. Josie Maran is a super model and mom of two beautiful girls, who created a non-toxic, eco-friendly, high performance beauty line infused with organic argan oil. Her line has become one of my favoirte natural and organic makeup lines because it delivers results! All three of my favorite go to natural beauty products to get my glow are Allure and QVC award winners year after year and featured in all major magazines and online publications. Here is an easy three step system anyone can follow to acheive glowing and healthy skin the natural way, everyday. Organic Argan oil is Josie's signature ingredient in all of her skincare and makeup line. Argan oil is nature's richest form of essential fatty acids that will deliver that instant, dewy fresh glow we all want without making our skin look oily or messy. Organic Argan oil great for all skin types and works great for my oily / combo skin. It makes skin look and feel fresh and glowing! Just add 1-3 drops of organic argan oil to clean hands and apply as you would your normal moisturizer. Add a few drops to your hair for instant silkiness and shine, in your bath water or apply to your body as an overall body moisturizer after your shower. Your skin will look juicy, plump, fresh and glowing! My favorite way to get my skin glowing and even out my skin tone is a full coverage tinted moisturizer! 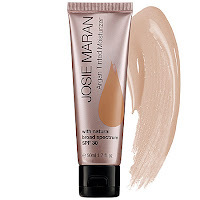 Josie Maran's Tinted Moisturizer is my go-to product for glowing skin because it gives you that beautiful glow but with really good coverage and an spf of 30. 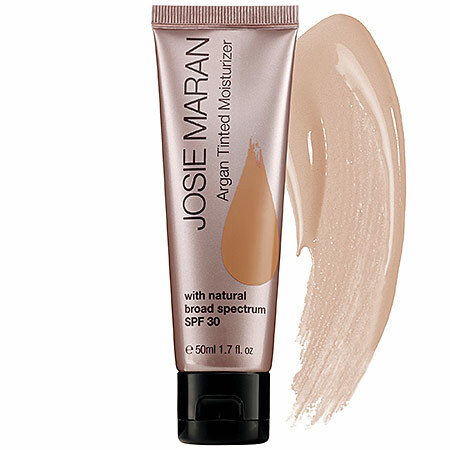 Josie's tinted moisturizer is an amazing formula that is a sunscreen, moisturizer and foundation in one. It adds an instant fresh dewy glow while covering uneven skin tone, discoloration, dark spots, dark circles, breakouts, ect. you may have. This full coverage TM contains Josie's signature ingredient, 100% pure organic argan oil, as well as antioxidant powerhouses like pomegranate oil and goji berry and natural papaya extract to hydrate and rejuvenate skin’s appearance. It's also paraben free, sulphate and phthalate free. It not only evens out skin tone but provides the added moisture your skin needs. This is definitely a must have product for every woman! In fact - Josie's TM is so hydrating, you can skip the argan oil. This multi-tasking tinted moisturizer is a must have and has plenty of organic argan oil to keep your skin glowing. If you want an on the go glow product with color - this is it! I'm a big fan of Josie's Argan Color Sticks because their a balm of hydrating, anti-aging ingredients - with a beautiful color. The one that started it all was the color in "Rosey". Rosey is a cult favorite and mauvy rose color which reminds me of a beautiful bouquet of roses, pink and mauve tones all rolled into one beautiful argan color stick. This rose shade looks gorgeous on all skin tones and works for every age range. It just gives you that fresh, pop of color we all want. I won't ever be without these color sticks and their always in my purse everywhere I go. So as you can see, you can literally moisturize, add some spf with coverage, a beautiful pop of rosey color and walk out the door looking naturally beautiful! 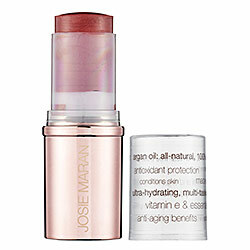 For an added glow: I love to apply Josie Maran's Argan Illuminizer . She has three new illumanizing products, the Enlightenment Illumanizer serum, the Enlightenment illumanizer wand for a glow on the go, and the Enlightenment illumanizing powder. Josie's Argan Illumanizer's are a great for highlighting and adding a subtle luminosity to the face, collarbone and body. Illumanizer won't let you down if you want that added, crushed pearl, super model glow. You can purchase Josie Maran Cosmetics on Josiemaran.com, Sephora.com, in Sephora stores and at Amazon.com. To learn more about Glossier and their unique line of beauty and skincare products, please visit Glossier.com.